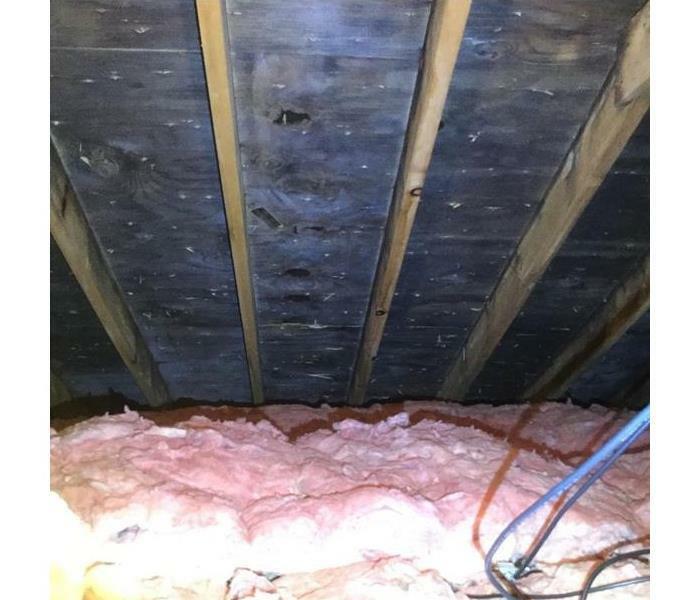 Attics are susceptible to mold and because homeowners seldom go in their attics, the mold can be extensive. In order to evaluate and hopefully properly determine the cause of the mold requires an understanding of roofing, insulation, ventilation, indoor and outside environmental conditions and mold remediation. Don't risk your roof to inexperienced contractors, call in SERVPRO of Elgin/Northwest Kane County. Remember this, "you don't have a mold problem, you have a moisture problem." Any place that water can come in contact with materials which are difficult to dry can definitely grow mold. 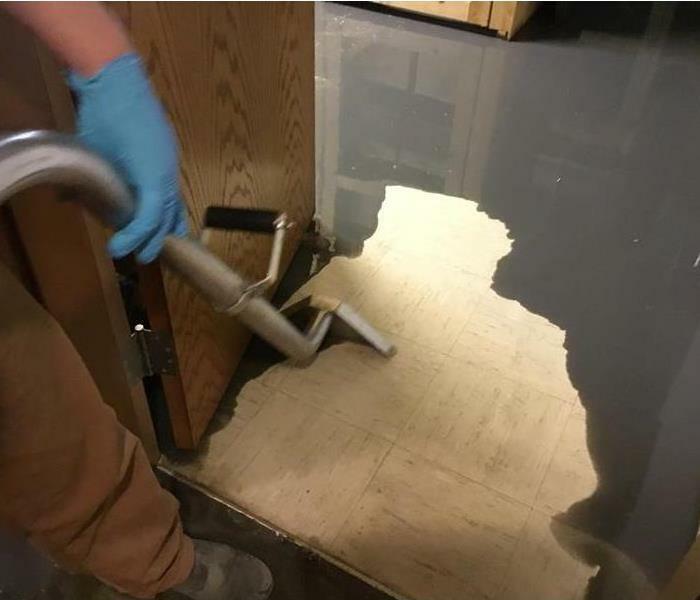 This commercial basement was badly flooded, so much so that the oil reserve tank for the hydraulic elevator was submerged and 40-50 gallons of oil mixed with the ground water. What can you do? We used "Pig pads" which are oil but not water absorbent. We were able to float the pads on top of the water and absorb the water, prior to pumping the water into the storm drain. 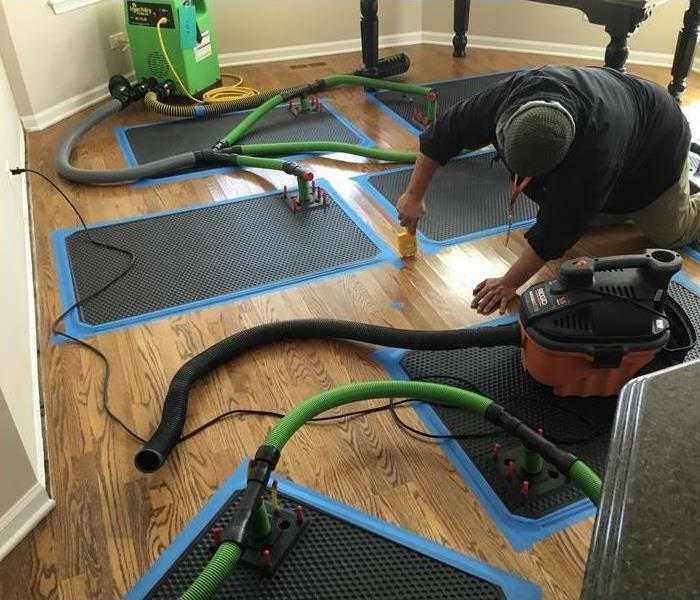 SERVPRO of Elgin/Northwest Kane County, getting the job done! This is not your run of the mill amount of water! This nursing home was very close to a water retention pond. Although the pond didn't breach, the water table in the surrounding area was extremely high. Although we had 5 4" gas powered pumps, we could not pump that water out for 3 days! Then the cleanup began!! This Middle school had a fire in the learning resources center which also contained their computer lab. 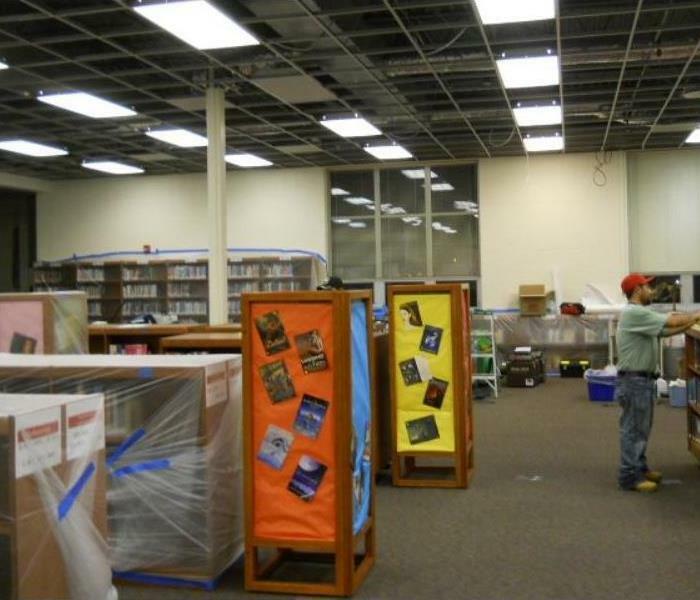 In addition to needing to clean all of the books and computers, we had to make sure that they didn't get dirty again as the cleaning of the structure was being done and while the ceiling was being cleaned and ceiling tiles were being reinstalled. Lots of painters plastic was used to keep everything clean; after it was cleaned!!! Securing a property after a fire is the first priority. Windows are broken, doors may have been kicked in and walls may have openings that are not supposed to be there. Our trained staff can properly secure your home or business to give you the piece of mind that no further damage (or theft) to your home and belongings will occur and everyone can concentrate on getting things cleaned and repaired. 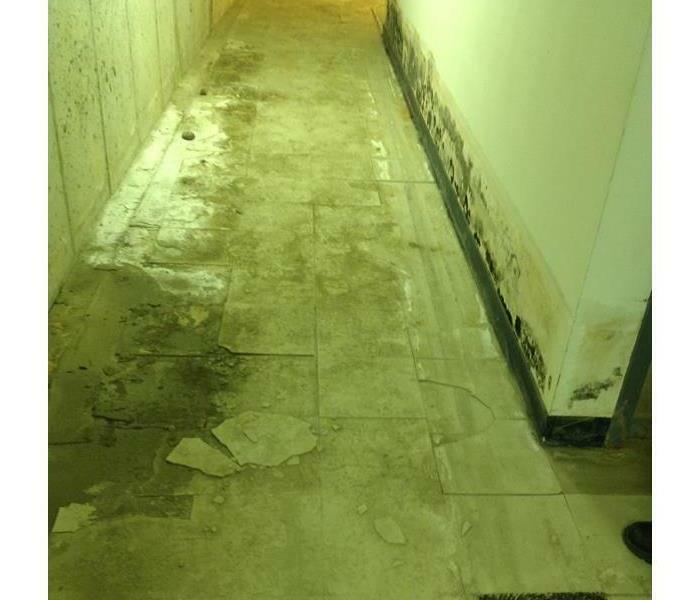 Water damage in any commercial structure has complicating issues. 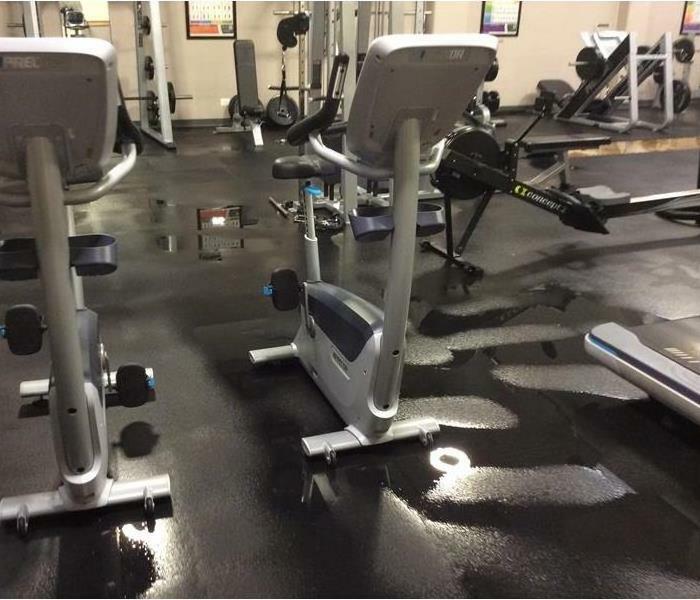 In this scenario, the workout center in this company was flooded due to strong storms that backed up water into the basement. What makes this more complicated is that we cannot just extract the floor like if it were carpeting. And in addition to that, there is very heavy equipment on top of the thick rubber floor mats. First we had to remove as many accessible floor mats as possible. Then we needed to move the heavy equipment to remove the rest. All of the floor mats needed to be cleaned and properly dried. Hundreds of those mats were brought outside so that they could be cleaned and disinfected and most importantly dried! Once everything was dried properly, we were able to reinstall all of those mats and got the employees back to pumping iron!! Assisted living centers, adult living, nursing homes are becoming more popular as our population is living much longer. Unfortunately the one thing that all of these structures have in common is that they all have multiple sources for water. Most units, that have individual cooking included within each unit have at least 7 individual water supply lines and 4 drain lines. This is in addition to all of the facility water lines, drain lines, fire suppression lines and outside faucets. All of these potential sources for water damage as well as potential problems due to weather. In these situations, having extensive knowledge of the operations of these facilities is as important as having excellent mitigation experience. 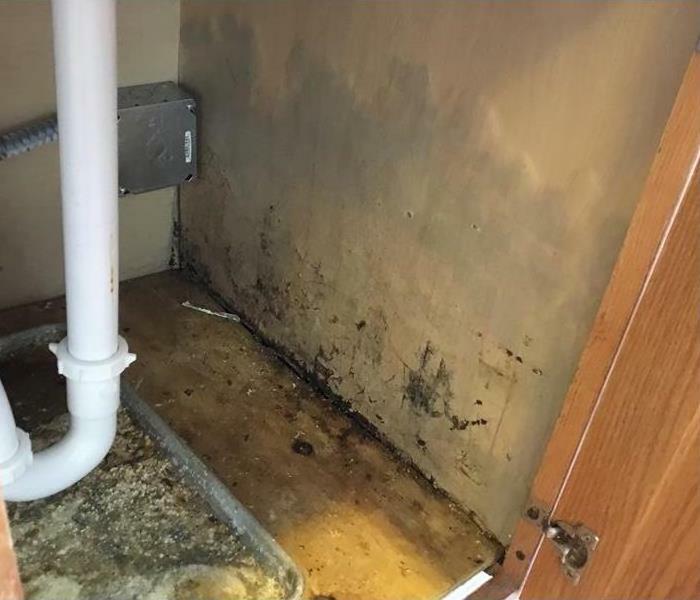 SERVPRO of Elgin/Northwest Kane County has provided water, fire, mold, remodeling, and many other services to over 170 of these facilities in the last 10 years. 847.697.8500. The storm moves through your town and the winds are howling. You hear bumps and sounds that you have never heard before, but at least you are in your home and safe. After the storm passes, you can the courage to venture outside and assess what mother nature has done to you! 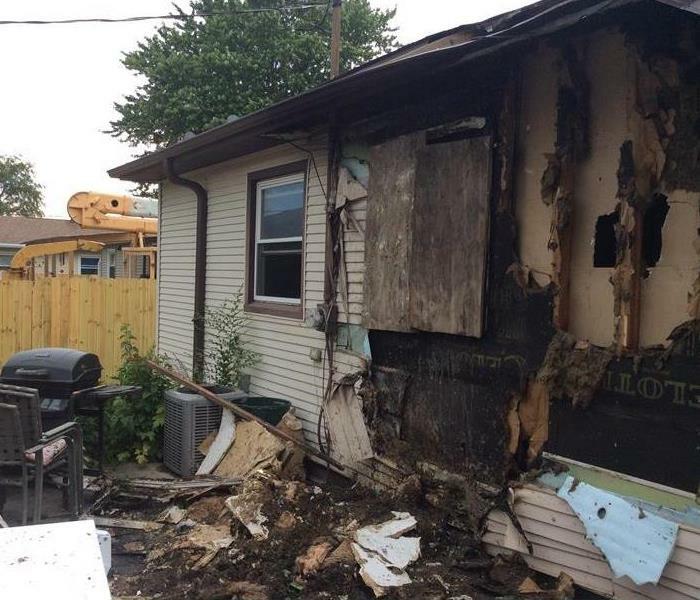 What do you do when you see that half of the side of the siding on one side of your house is completely gone? What do you do to keep rain and wind damage from affected the inside of your home? Well, call SERVPRO! Whether it is night of day, raining, snowing or all of the above, SERVPRO of Elgin/Northwest Kane County will take care of you. 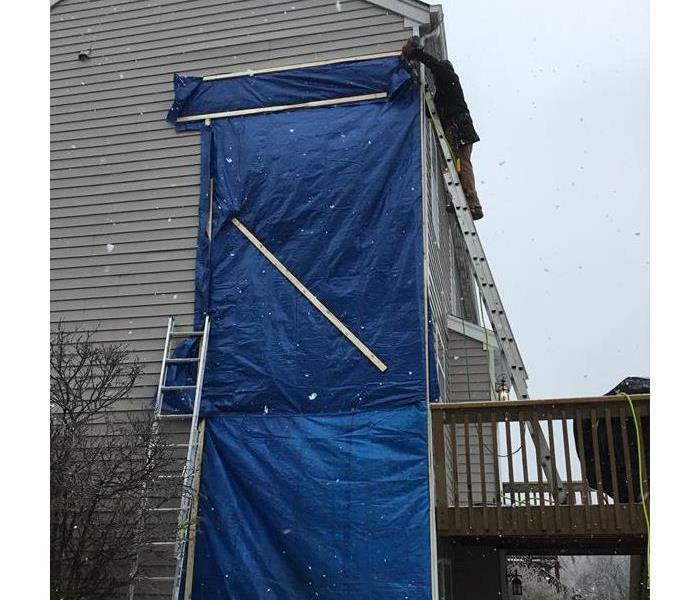 Whether you need tarping, board-up or a combination of the two, we will secure your home to protect it until permanent repairs can be made. SERVPRO of Elgin/Northwest Kane County, 847.697.8500. Going through a training class is a first step for every remediation technician. You sit in a class and a teacher tells you the important elements that need to be addressed to ensure that you learn about a general topic. However, it is the experience of knowing what to do in a particular situation that determines success or failure. Our technicians have the training and have gained the experience to be able to "pull success from the jaws of failure." Monitoring a job is a very important aspect of every job but it is a truly critical component when it comes to drying hardwoods. Drying hardwoods requires specialty equipment. Knowing when to adjust the equipment, such as reducing laminar airflow and increasing the vapor pressure differential is what makes us successful! Elgin/Northwest Kane County, we have the experience to get your jobs done right! 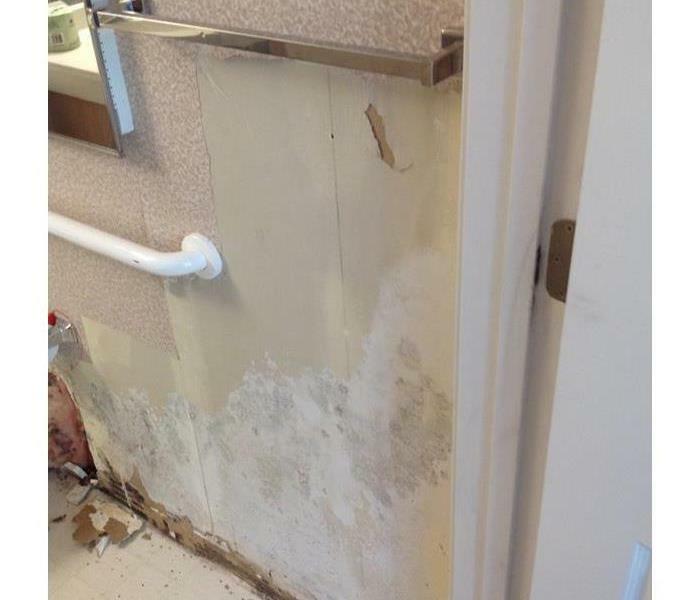 Care needs to be taken when removing materials due to mold contamination. 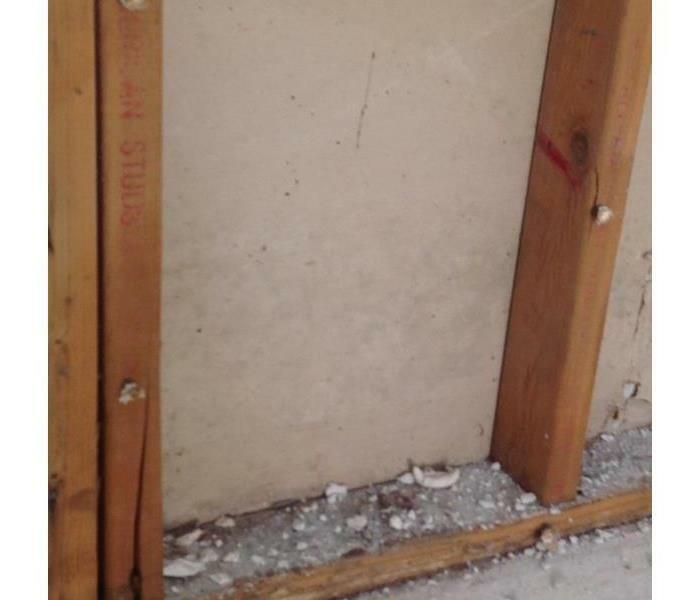 In this picture, another restoration company removed one side of the drywall on an interior wall, hoping that the other side would dry out now that the wall is opened up. As you can see, it didn't and the homeowner still had a very serious mold issue to address. When commercial space sits idle, unfortunately it is seldom checked on. The basement of this large building sat idle without a tenant for a couple of years. When interested tenants started inquiring about the space, the building management found lots of problems and quite a bit of mold. Remember, "You don't have a mold problem, you have a moisture problem." If drywall and other building materials get wet, drying them out quickly is the best bet to keep from getting mold. But if you have wall paper, especially vinyl wall paper, you are actually locking the moisture into those materials and keeping them from drying out. Therefore, if you have building materials that are wet and are covered with wall paper, you will need to remove the wall paper to ensure everything dries out properly. 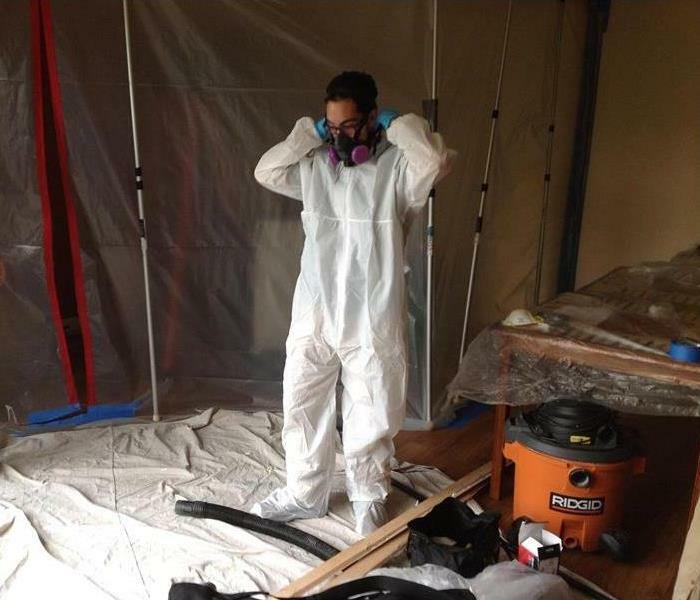 After getting your mold containment area set and having the affected area under proper pressure differentials, making sure the men who will be handling the mold are properly dressed in personal protective equipment (PPE) is of upmost importance. 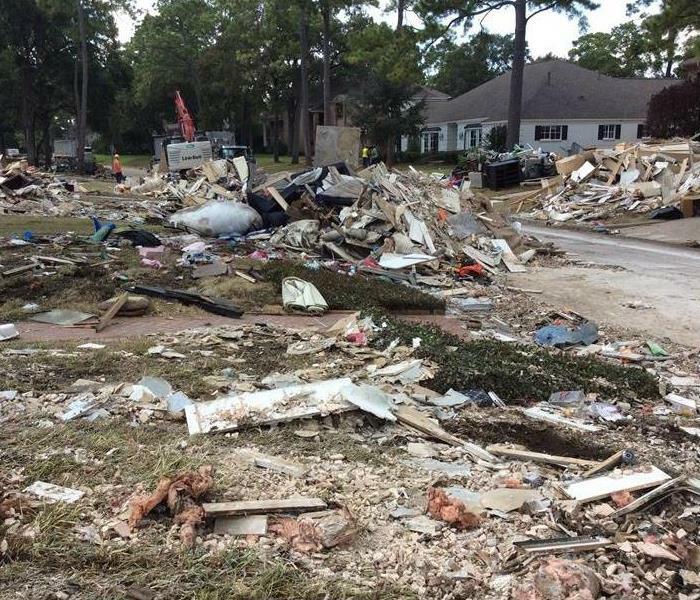 After all of the water, damage, garbage and smell, this is how a lot of homes looked when we were done with them. They still had a long journey before they were complete and they could put this horrible event behind them. At least we left them clean, and ready for reconstruction. I think most were happy with having at least that. This picture shows the water line of how deep the water was in this house. Considering that the ceilings are 9 1/2 feet tall, I think the water line was about 4 feet. The two things that people seem to remember most about being in a hurricane affected area are the smell and the garbage. Although I cannot show the smell, you can see the piles of garbage that are outside of each house, lining the streets. If you look hard, you can see a dump truck being loaded by a heavy piece of equipment. 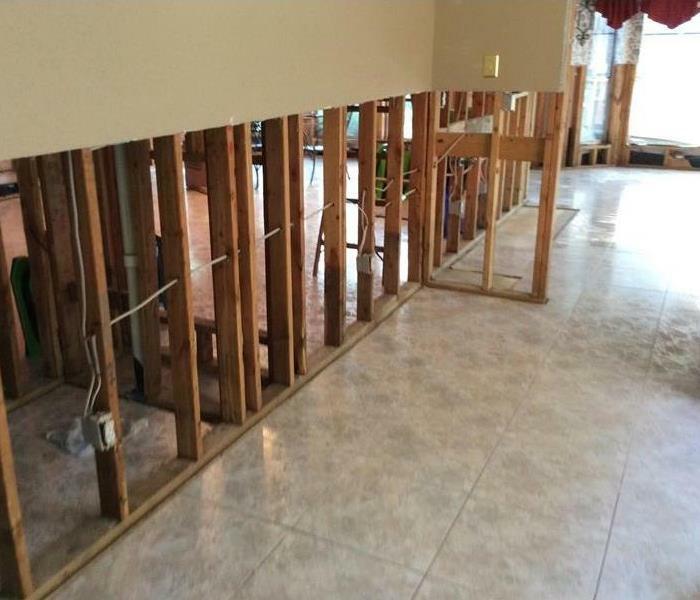 When we have water damage in the winter due to pick breaks, sometimes the damage is quite extensive, damaging the electrical system in the home or business. 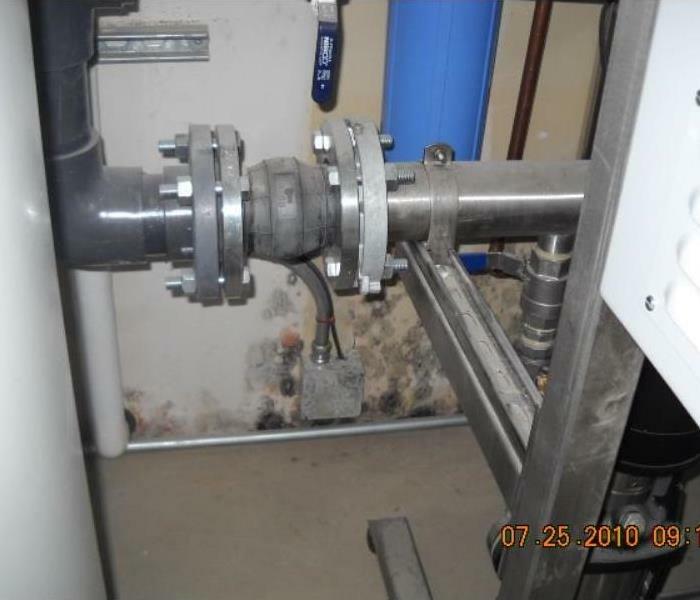 In those situations, we need to get heat into the unit to prevent additional pipe break damage, and enough power to run the equipment to thoroughly dry and stabilize the unit. 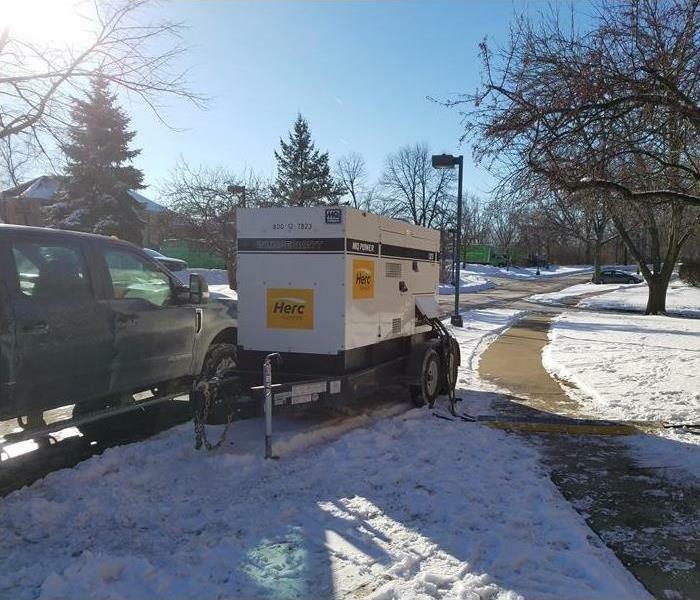 When that happens sometimes we need to bring in temporary portable power units called generators. This is an example of the unit we brought in to heat and dry a small apartment complex. 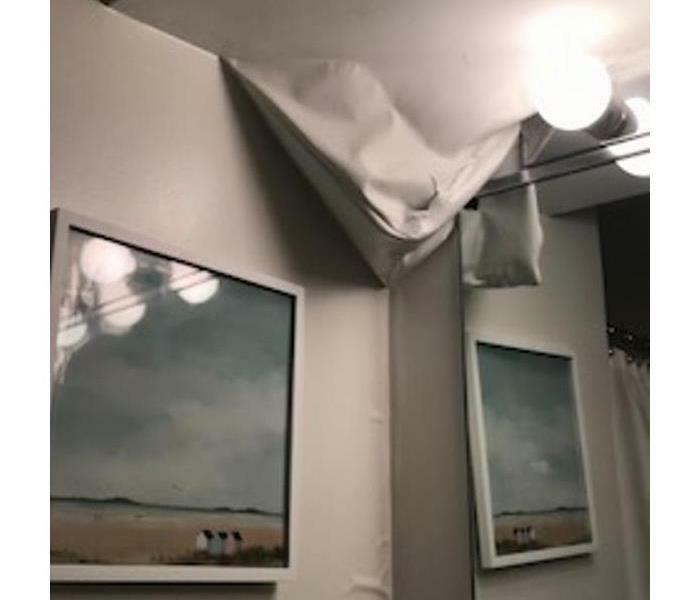 Water damage isn't funny. However . . . sometimes the things we see during an initial inspection of a water loss do LOOK funny. Here is a picture of a bathroom ceiling and wall that had a water damage in the unit above this one. As you can see, sometimes the water cannot find an easy path for it to go and actually gets caught in the paint and forms a big sack of water! Fire cleanup and putting things right! After all of the debris is removed, and the burned materials are removed and cleaned, the reconstruction process begins. We will reach out to the city building department to ensure that the rebuilt structure meets the current building codes. 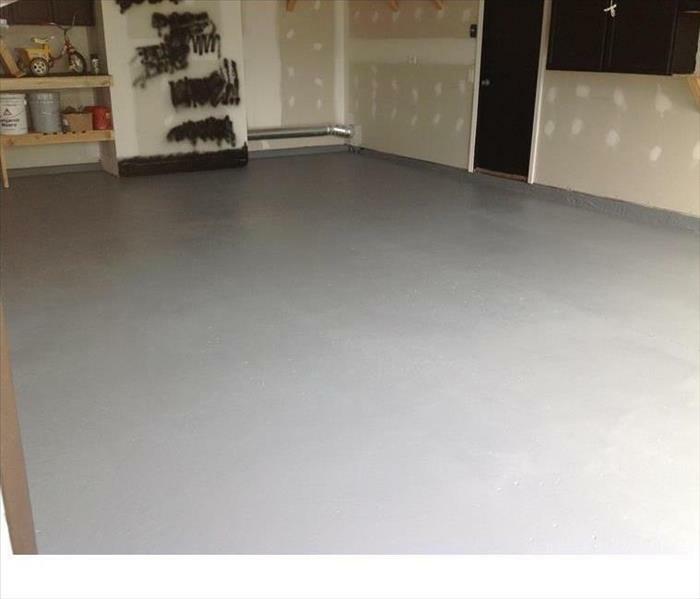 We will encapsulate any remaining raw structural material with a coating that will lock in any remaining odors. Then we replace insulation, drywall and paint. "Like it never even happened!" Fires are terrible. They are scary. They destroy the stuff that it comes in contact. When you experience a fire, most people say they feel violated and out-of-control. 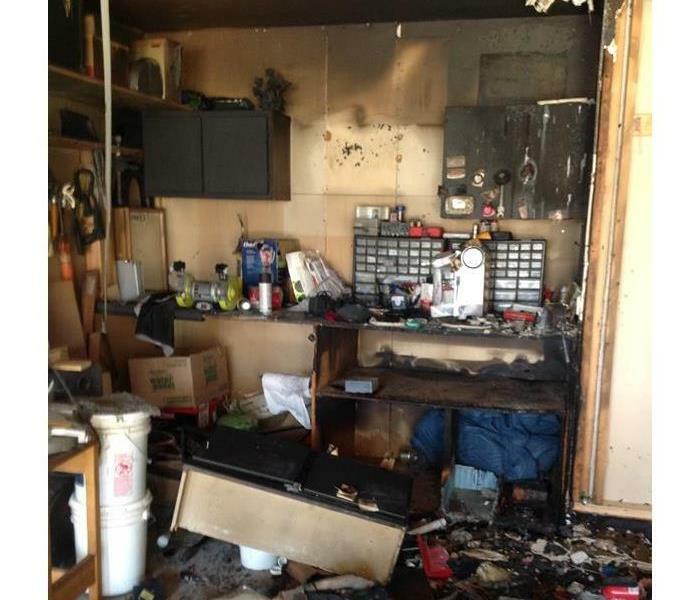 Here is an example of a small garage fire and the overall damage it caused. If you look at the wall, you can see where the plumber had to fix the outside water valve which froze and broke. When those valves break, you will not know that the valve is broke until you use the outside hose and water starts pouring into your basement. 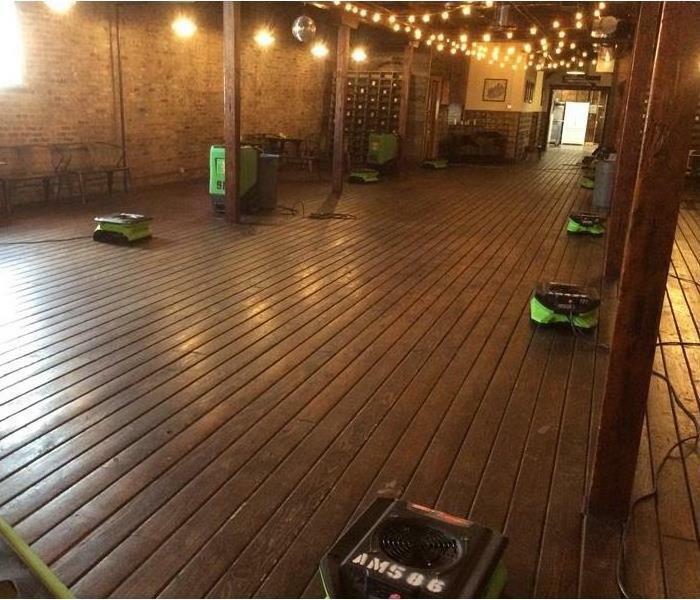 SERVPRO of Elgin/Northwest Kane County, making it "Like it never even happened." How do you get it dry and keep the business open? At SERVPRO of Elgin/Northwest Kane County, we know how to get things clean, dry and safe. Our strongest knowledge comes from knowing how to keep the doors open! This is a very popular banquet hall and of course, they are fully booked! When they had a pipe break, we were able to do all the emergency extraction and clean up. That we were able to do before guests showed up. We came back after all of the party goers headed home for the night, and got the equipment set up for drying. It took us an extra day to get everything properly dried, but making sure they were able to meet their client obligations was especially gratifying!! In commercial kitchens, things get wet. Things get splashed, dropped and then you clean them up. Seeing water on the floor or down a cabinet is not necessarily a problem. Seeing water come out from under a cabinet, can be a problem, but where is the problem?? After further investigation by emptying a sink base cabinet, we found that there were signs of extensive damage behind the cabinet. 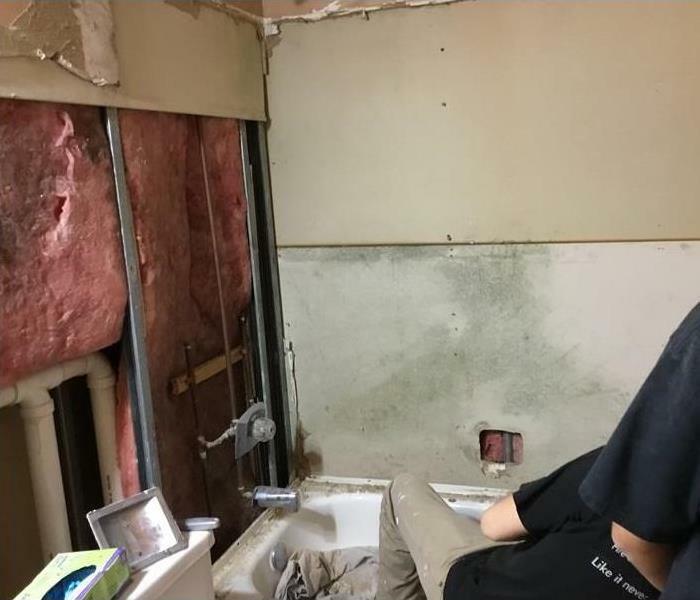 Although we ended up having to remove all of the cabinets and found lots of water damage we might not have found it if we didn't do a little digging!! Sometimes, the job is not pretty! 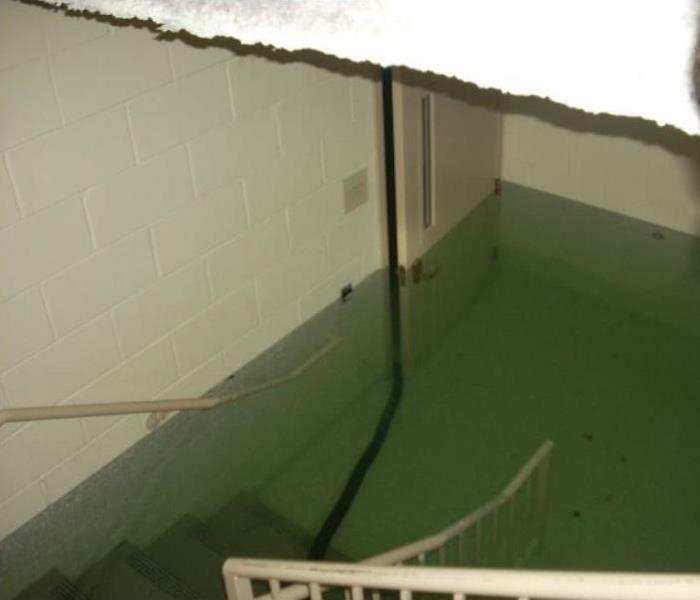 Here is an example where a floor drain is backing up into the lower hallway of a multi-unit complex. 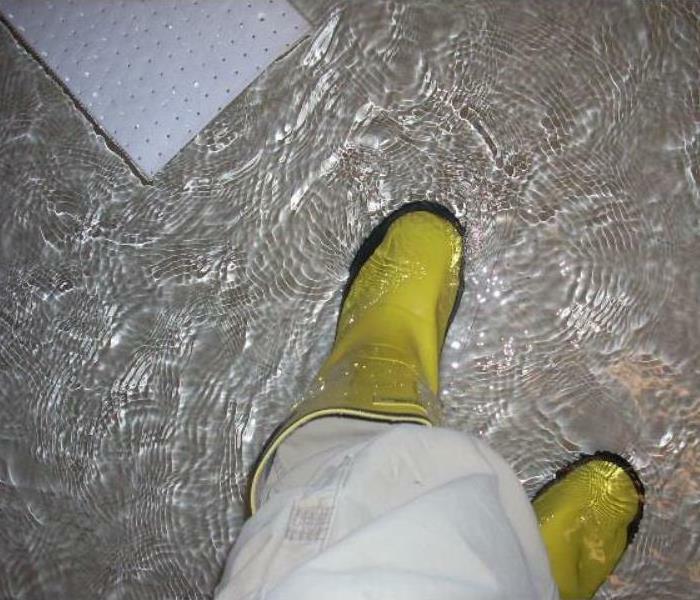 It isn't pretty, but we know that the first step in any water damage situation is to get up all of the water. 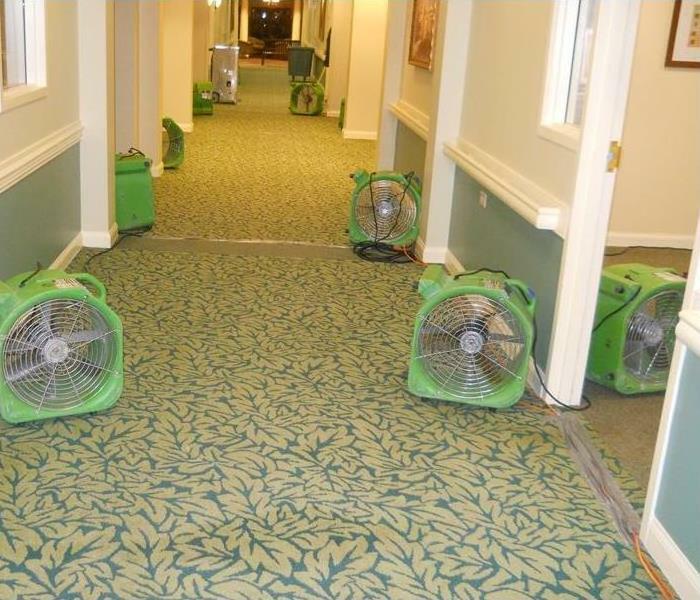 Our Production managers and Crew Chiefs are fully trained and know how to handle any type of water damage category. SERVPRO of Elgin/Northwest Kane County, when you absolutely need it done right!! This shows how sometimes we have to really work to get to the areas we need to dry. This is the kitchen area of a very BUSY event/banquet hall that had a burst pipe. The largest banquet hall is directly above this kitchen area and the insulated metal ceilings of the kitchen were all wet and needed to be dried. 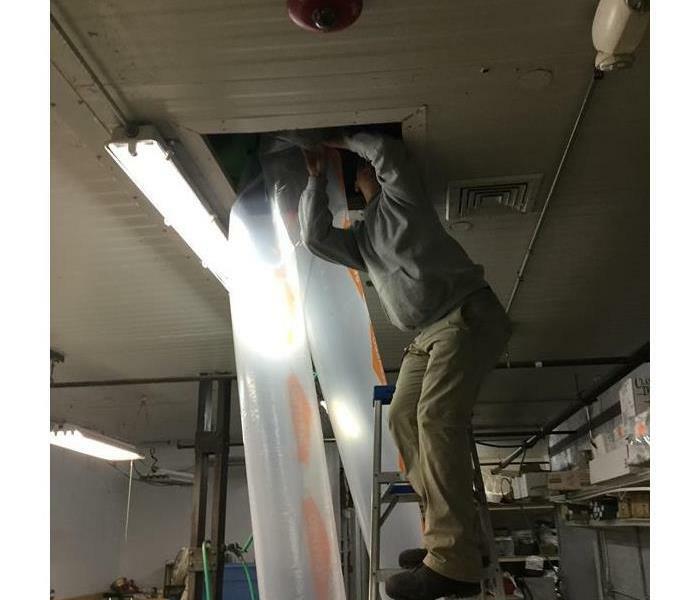 In this case, we used desiccant dehumidifiers to get the difficult access areas dry. 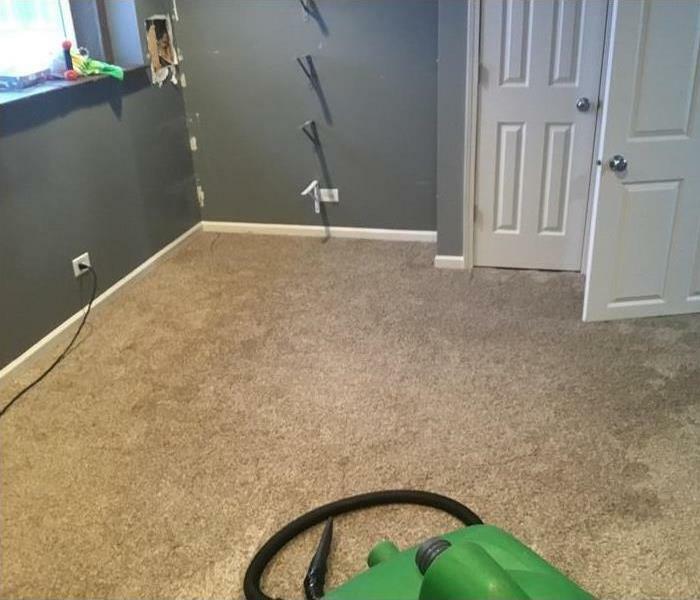 SERVPRO of Elgin/Northwest Kane County making it "Like it never even happened." Fires get hot, really hot!! I am sure everyone realizes that fires are hot. You may be surprised how hot? As you can see in this picture, that the paint on the cinder block walls actually bubbled due to the heat. The heat along the ceiling of a fire can reach 1,000-1,400 degrees. Although the brick was not structurally damaged, we did need to scrap the paint off, clean the surface and then repaint. 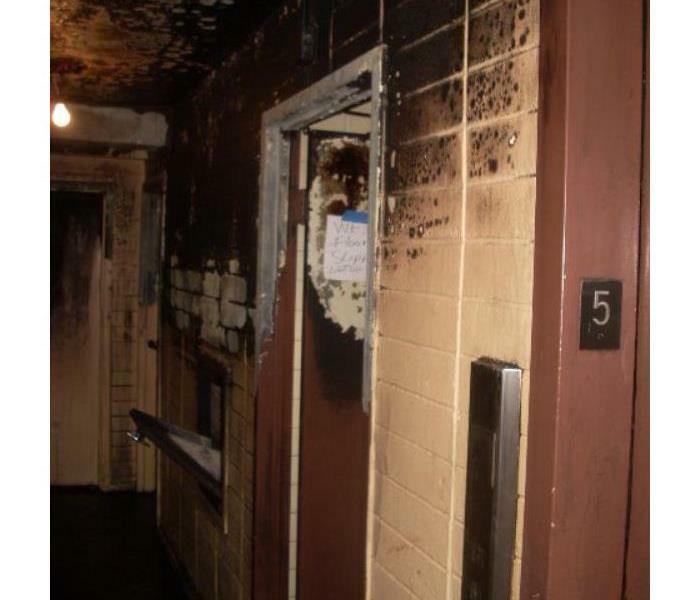 This fire was isolated to a small area of the building, but the fire started in the garbage chute and it carried the fire to all 15 floors and caused smoke damage in residential units on every floor. SERVPRO of Elgin/Northwest Kane County was able to take care of all of these families and got them back into their units quickly!! 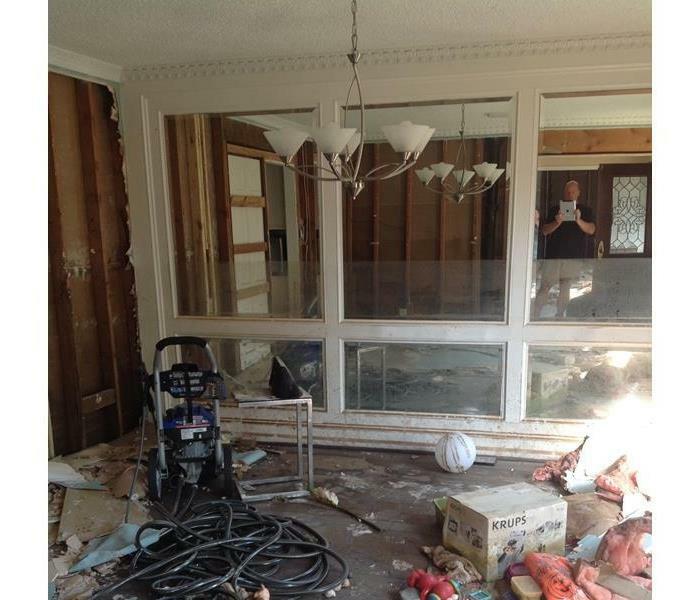 Here is an example what can happen when a small water damage is not address quickly. This was truly a small water leak. The pipe was repaired, but they didn't address the water. As you can see, although there is not a huge amount of mold, the moldy material is in a very tough spot to work. Proper removal protocols will require containment barriers and negative pressure. Although the removal of materials was difficult, the rebuild was even worse! Multiple trade unions were involved, and lots of additional work is required to get this commercial building back "Like it never even happened." Call in SERVPRO of Elgin/Northwest Kane County early to dry out your buildings and eliminate lots of headaches! 847.697.8500. Sometimes you just need to be creative!! When a tornado caused serious damage to the Streator Illinois community theatre, what do you do with the 60,000 costumes so that the building can be repaired? Call in SERVPRO of Elgin/Northwest Kane County! So what do you do with all these clothes, content, and stage props? We rented two 53' trailers and made them into huge closets!! 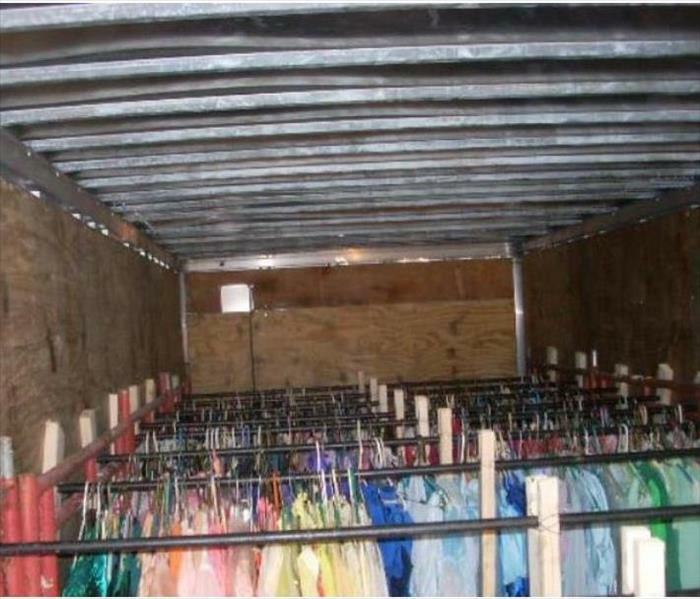 This allowed the costumes to stay in a secure container until all the repairs were completed. SERVPRO of Elgin/Northwest Kane County, 847.697.8500. When you need it "Like it never even happened." When you need it clean, call in the green! SERVPRO of Elgin/Northwest Kane County was called in to help return the Edgebrook Lutheran Church back to preloss condition after they had a horrible fire. Some items we could clean, other things needed to be replaced and other items needed help from our supportive specialty sub contractors. 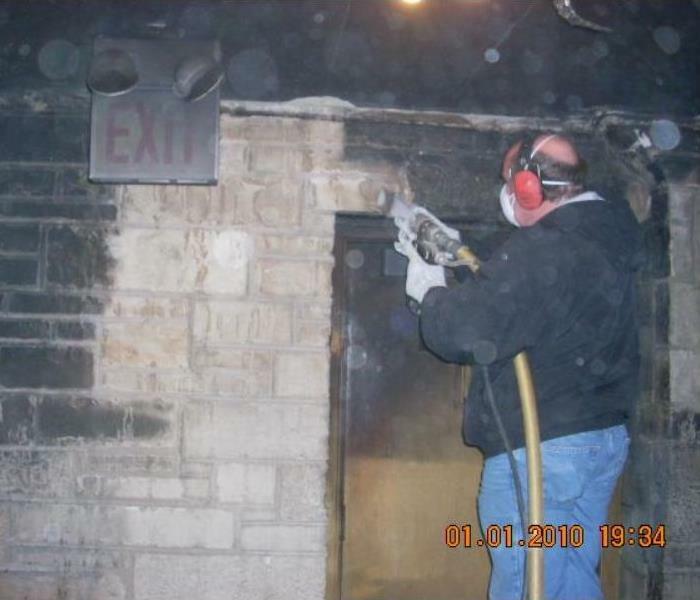 This picture shows how we were able to return beautiful limestone walls back to preloss condition with dry ice blasting. 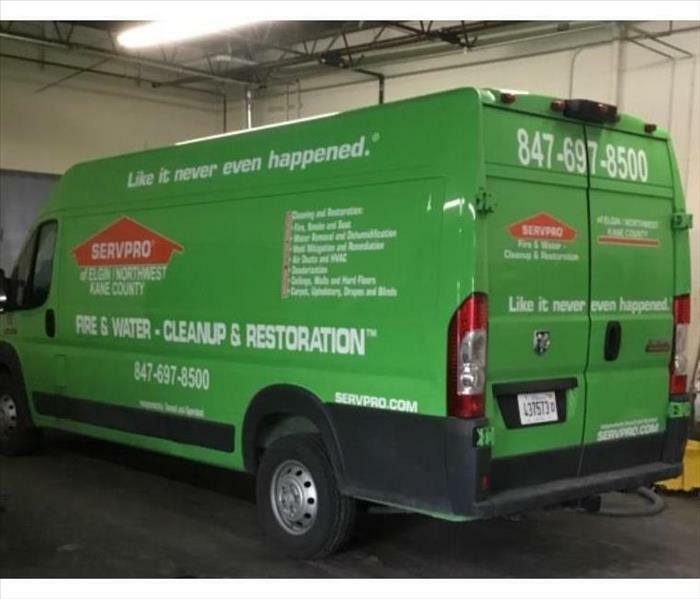 Whether you have fire, water, smoke or mold damage, SERVPRO of Elgin/Northwest Kane County has the experience to get you back "Like it never even happened." The Elgin Boys and Girls Club needed toys, lots of toys, to help support their efforts to make sure all the children had toys for Christmas. So they called on SERVPRO of Elgin/Northwest Kane County to help! 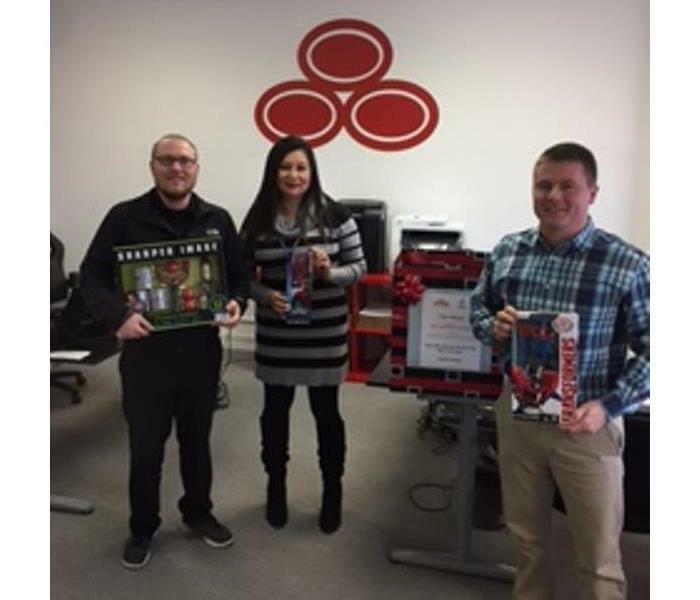 SERVPRO reached out to our community partners and were able to collect lots of toys! It was a great felling helping this worthwhile organization meet their needs. Call on SERVPRO of Elgin/Northwest Kane County, 847.697.8500 when you need help too!! Who is the new shiny green van? It's SERVPRO of Elgin/Northwest Kane County ready to serve the towns of Elgin, Hampshire, South Elgin, Carpentersville, Gilberts and all of Northwest Kane County. Whether you have have water, fire, smoke or mold damage, we are here to help!! 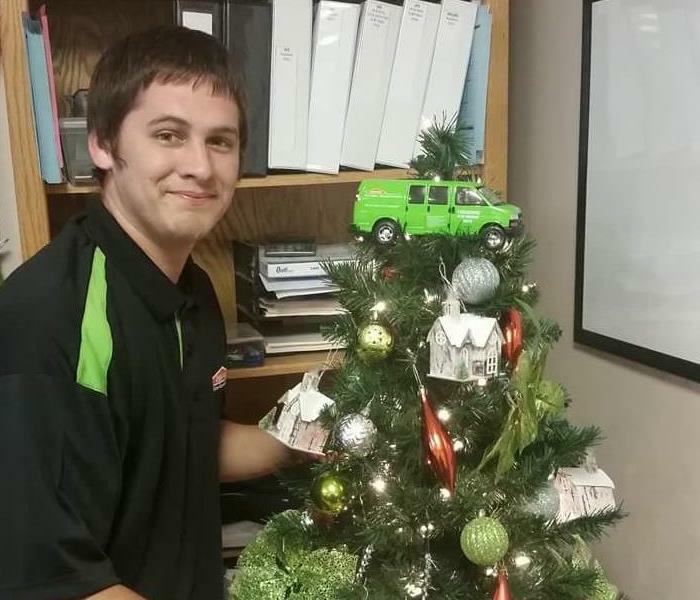 Jake, one of SERVPRO of Elgin/Northwest Kane County's technicians, finishing up our Christmas tree benefiting Ecker Center for Mental Health. 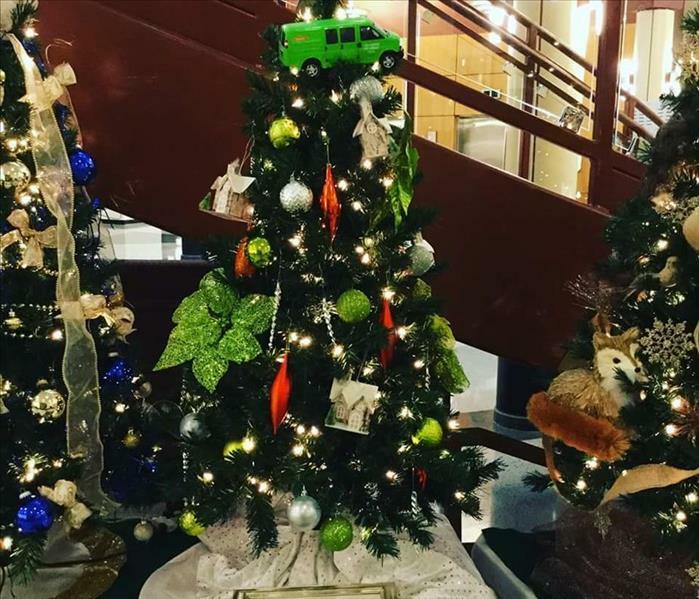 Ecker is one of the community organizations that we proudly support. 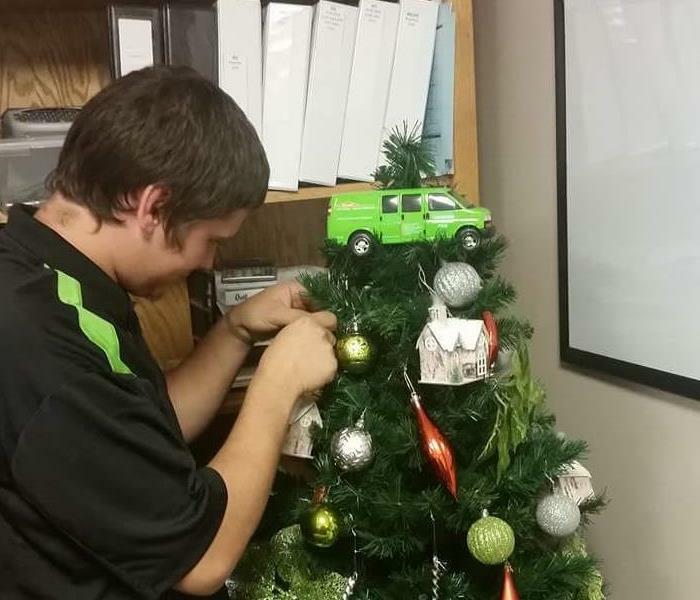 Jake is very proud of his decorating skills for the SERVPRO of Elgin tree. 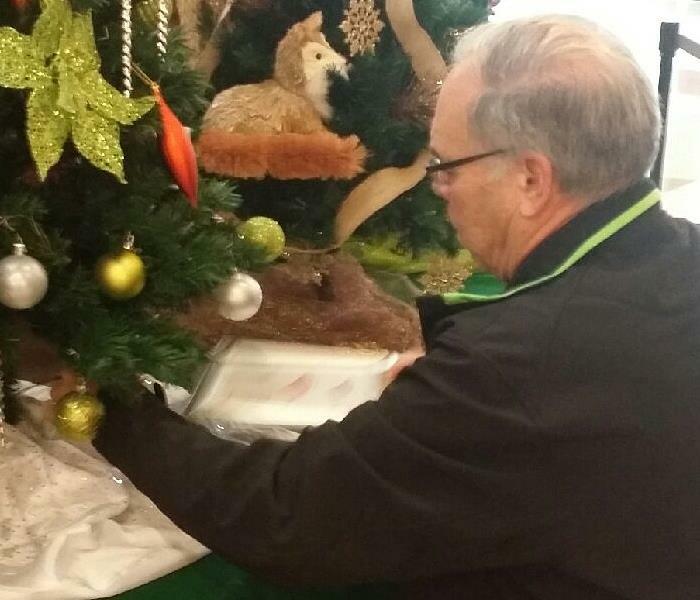 Dennis, a production manager at SERVPRO of Elgin/Northwest Kane County, at the Gail Borden Public Library setting up the tree. We knew Dennis was a great project manager, we just didn't know he was so artistic as well! When you need the job done, no matter what the job, call SERVPRO of Elgin/Northwest Kane County to get it done!